Remembering the good old days.... We would always dine at Barrio Fiesta in J. Bocobo St. in Malate, Manila during the weekend. Oh yes! those were the good old days... family times, great food, fond memories. But how can we ever forget our favorite dishes.... now list them down Bouillabaisse (Barrio Fiesta Seafood Cream Soup); the ever so mouth watering Crispy Pata; the gravy rich Bulalo Steak; yummy Camaron Rebosado; and the delectable Kare-Kare with a pinch of Bagoong (Shrimp paste). But as time progresses, things change, people age, but the tradition still stays the same... but now with a different twist. Now from the long line of new generations from the clan of Barrio Fiesta, we now have IBAYO. 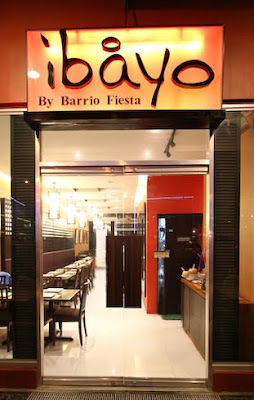 IBAYO by Barrio Fiesta, (ib'ayo) - meaning across prep. on the other side of; sa kabila; sa ibayo, sa kabilang panig o ibayo. I've had one of the most fulfilling meals that I have ever had, the taste and aroma of the food being served to us was very tempting and it was really hard not to eat that much!! God help us..
Now may I take you to a place, a happy place where all food served is good and gone. You must try their Paella... this rice dish is a must!! Grilled pusit... done just perfect! It was such a refreshing place to dine-in, will definitely be back again. Ever dream of Kaya Toast at Singapore, fret no more for it is already at YKK aka Ya Kun Kaya Toast. If ever you may be passing by Ortigas, then this is a must visit. Head over now and get your taste buds scrambling for more!! Please do visit their FACEBOOK PAGE to be updated on promos and goodies. To the layman's interpretation of O'sonho, one would think that it is a classy Japanese restaurant, well if you think you are definitely in for a surprise. O'sonho is Portuguese for "the dream". We were lucky enough to have been invited by Eastwood Management to showcase O'sonho, a Portuguese fusion restaurant. Anton Nik Brancik, the owner was very kind in showing us how passionate he was with his restaurant, how he came to love it so and why people dining always have a smile on their faces. now to day dream a little before getting home. It was definitely a wonderful to have experience O'sonho ( pronounced as Osonyo). You should have a visit, and you will come back again for sure.